Adjust the machine and select an appropriate load. 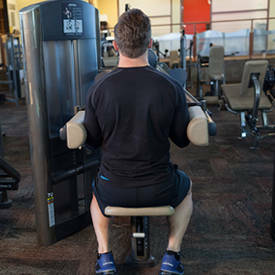 Seat yourself facing the machine with the base of your upper arm against the pad. 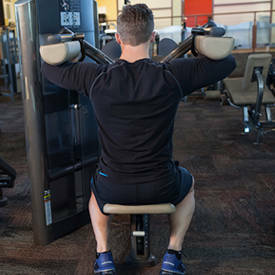 Maintain a neutral spine with your chest up and head looking forward. This will be your starting position. Initiate the movement by moving your upper arms laterally, away from the midline of the body. Continue until your upper arms are parallel to the floor. Pause briefly, and then return to the starting position.